Looking for a simple recipe that will look and taste outstanding on your holiday table? 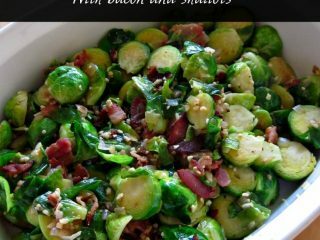 Make Brussels Sprouts with Bacon and Shallots. Whenever I make this side dish, it gets rave reviews (even from the kids!). It’s a wonderful way to introduce them to Brussels sprouts. This Brussels Sprouts recipe is a wonderful change from the usual broccoli or green beans side dish. We have this for Thanksgiving every year, but it would also be a great accompaniment to your Easter ham. My kids always request it for any kind of special or celebratory dinner. I wasn’t familiar with shallots until a few years ago, when a recipe introduced me to them, and now I just love them! They have such a deep, rich flavor that makes everything taste better. In your grocery store’s produce section, look for bags of 1 1/2 – 2 lbs brussels sprouts. They’re usually near the bagged salads. I’ve used bagged sprouts from both Aldi and Costco. If you’re looking for a more everyday version, try my Roasted Brussels Sprouts. Heat a large nonstick skillet over medium-high heat. Chop the bacon into small pieces, add to skillet and saute for 5 minutes or until bacon begins to brown. Remove skillet from heat. Remove the bacon from pan, reserving 1 tablespoon drippings in pan (discard the remaining drippings). Return skillet to medium-high heat, and stir in bacon, shallots, and Brussels sprouts. Stir frequently to saute for 4 minutes. Add garlic, and saute for 4 more minutes or until garlic begins to brown (stir frequently so that garlic does not burn). Add the chicken broth and bring to a boil. Cook for 2 minutes or until the broth mostly evaporates and the sprouts are crisp-tender, stirring occasionally. Brussels Sprouts with Bacon and Shallots is linked up to Fluster’s Creative Muster Party at Fluster Buster and The SITS Girls Linky. 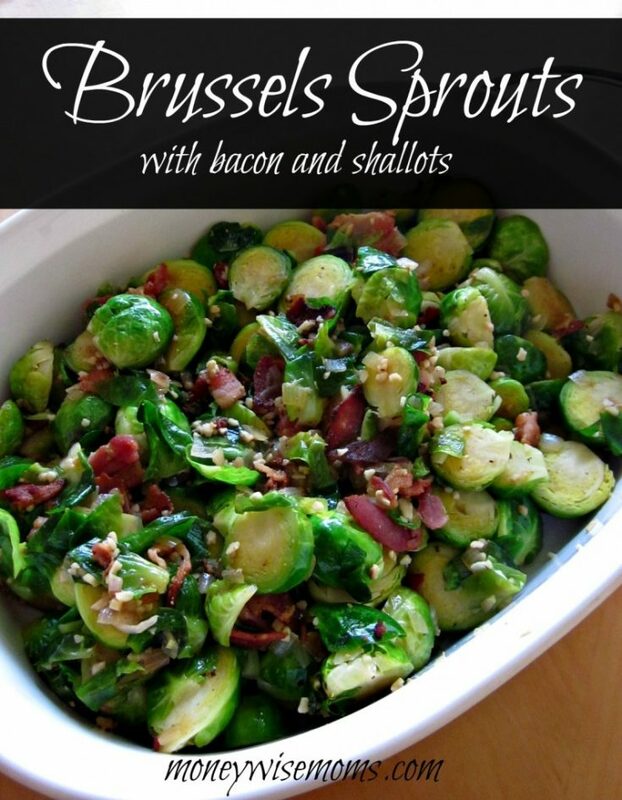 I love brussel sprouts – this looks so good! Thanks so much for linking this up to the Friday Frenzy – hope to see you again tomorrow!